Home > Special Offers > Parts & Service > Almost a good thing isn’t a good thing. Almost a good thing isn’t a good thing. Get up to $150 off on a set of four all season or summer tires from Continental. * Multi-point inspection and 6 months' roadside assistance offers included with any paid service. Roadside assistance is provided by Club Auto Roadside Services. Offer available from March 1 to May 31, 2019 and is subject to cancellation without notice. Up to $100 manufacturer mail-in or online rebate fulfilled via a Visa Prepaid Card available on qualifying purchases of select Continental tire sets of four made between March 1, 2019 and May 31, 2019. Please see participating dealer for details. 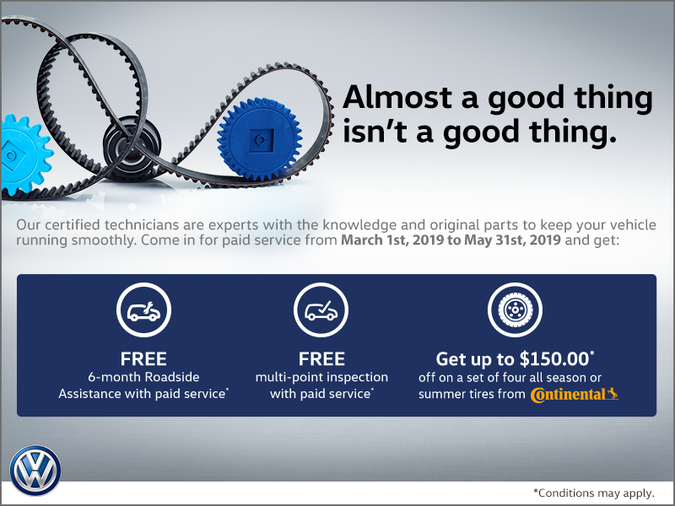 $50 point-of-sale discount applied to final purchase price before taxes available on qualifying purchases of select Continental tire sets of four made between March 1, 2019 and May 31, 2019. Please see participating dealer for details. Offers are subject to change or cancellation without notice. "Volkswagen" and the Volkswagen logo are registered trademarks of Volkswagen AG. © 2019 Volkswagen Canada.